Delivery of "E6 Type Shinkansen Komachi" and "MINI BRIEFCASE LAYOUT" start! We Rokuhan start delivery of E6 Type Shinkansen Komachi and MINI BRIEFCASE LAYOUT in Japan, then will start delivery for overseas. E6 Type Shinkansen Komachi was developed for high speed shinkansen that it gets maximum speed 320 km/h and for replacement old-type shinkansen, "E3 Type shinkansen". This E6 Type Shinkansen has been in service at Tohoku area since 2013. Smaller than existing briefcase layout. Height: 175 mm Length: 235 mm Width: 75 mm. *Everyone can carry easily and anywhere, along with the miniaturization and weight reduction. *It is able to run R95 curved tracks. Miniaturized-size Z gauge runs though the small briefcase. *Diorama is a completed product. You can enjoy soon, once you prepare controller and cars sold separately. Note: All "E6 type Shinkansen komachi" and "MINI BRIEFCASE LAYOUT" in photos are molded samples. Please follow on Facebook:Delivery of "E6 Type Shinkansen Komachi" and "MINI BRIEFCASE LAYOUT" start! 【e-train controller 2】Introduction of more useful functions for e-train controller! Thank you for your continued interest in Rokuhan product! We Rokuhan will inform you continuously following of the latest arrival information on July 24th. It is an epochal product "e-Train controller" which is already start presale order, and can be operated model train by smartphone and tablet. *Able to operate model train by your own smartphone or tablet! *Get free app for e-train controller from both Android and iOS app store! *You can operate your DC and DCC cars by e-train controller! *Pre-installed "Train sound", "horn", and "crossing alarm sound" etc. *Operate not only Rokuhan Z gauge, but also other Z gauge, N gauge, and HO gauge cars. *Favorite sounds and music in your smartphone or tablet come out from e-train controller speaker. We would like to show movie for explanation of e-train controller important functions. Products will be on sale in August 2017. Please wait for our next hot news! * All in pictures are molded samples. Please follow on Facebook:Introduction of more useful functions for e-train controller! Thank you for your continued interest in Rokuhan products! 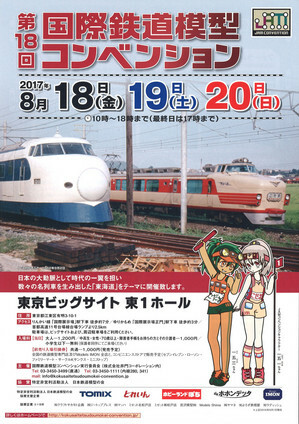 We Rokuhan will exhibit our products at the 18th JAM (Japan Association of Model Railroders) held in Tokyo Big Sight. The main feature of this time is to have an exciting corner in the booth to allow everyone to experience operating e-Train controller by using smartphone or tablet on hand after APP downloading, due to the release of e-Train controller. Also, we show many Rokuhan Z gauge products which are model train cars, structures, and accessories. We will sell some exclusive products only to get at Rokuhan online or showroom, also various kinds of Rokuhan products. 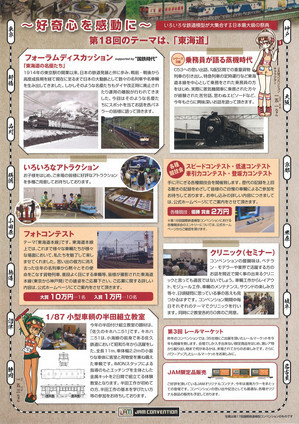 In addition, many exhibitions and projects related to various kinds of railroad models will be held at the event at other booth, too. We look forward to your visit and see you at our booth. Please be informed that our company will be totally closed from August 11th to 16th, as summer holidays. We will resume our business on August 17th, Thursday. We will not be able to respond to your inquiries during the above summer holidays. Delivery of "MINI BRIEFCASE LAYOUT" will start in August! in August in Japan, then will start delivery for overseas. Also, we Rokuhan prepared a movie this time to know more charm about mini briefcase layout! Let's go to a nearby retail shop to make a purchase reservation! Note: *S058 MINI BRIEFCASE LAYOUT in pictures are molded samples. Please follow on Facebook: Delivery of "MINI BRIEFCASE LAYOUT" will start in August! 【e-train controller 1】Start booking and introduction for the e-train controller! Rokuhan epochal new product "e-train controller" had appeared this time! You can operate your model train by your smartphone or tablet with e-train controller. *Operate not only Rokuhan Z gauge, but also other Z gauge, N gauge, and HO gauze cars. How much do you have interesting e-train controller? We will make up date more information of e-train controller on next time. We will start deliver on August 2017. Please make booking the store where is close to your living place. *All in pictures are molded samples. Please follow on Facebook:Start booking and introduction for the e-train controller! Introduction of JNR C11 Steam Locomotive No. 254 Type! We Rokuhan will start delivery JNR C11 Steam Locomotive Number 254 Type (Montetsu Smoke Deflectors) in Japan. We Rokuhan are really proud of release this C11 as sixth Rokuhan C11 line-up. It was manufactured in 1944 which had been in operation in Kyushu (九州) area. It is attached unique rectangle-shaped smoke deflector called "Montetsu Def" (門鉄デフ）. It is currently in stored in Aizu-Tajima (会津田島）Station, Fukushima. *Characteristic smoke deflector is made by etching parts. *Front coupler is replaceable. Able to drive backward and double heading drive by exchange. *It can run R95 curved track. It will be start to deliver in August 2017 in Japan. *C11 Steam Locomotive 254 in pictures are molded samples. Please follow on Facebook:Introduction of JNR C11 Steam Locomotive No. 254 Type! Thank you for your interest in Rokuhan products! We would like to announce a resale of C11, steam locomotive No.207, (T019-5) called "TAIJU" by TOBU Railway and YO 8000 Guard's van used for TOBU Railway steam locomotive "TAIJU" which begins operation starting from August 2017. In addition to YO 8000, "TAIJU" operates with 14 type passenger car. So, you can run your "TAIJU" with type 14 Limited Express Passenger Car available now from Rokuhan. Rokuhan would like to introduce basic information of type 14 Limited Express Passenger Car and how to make advance information based on normal formation to produce prototypical train consists. It is the "TAIJU" that we announced in our most recent new arrivals release information. The steam locomotive C11 and YO 8000 to be incorporated into formation are to be released in August 2017. DE 10 is available now from Rokuhan. Above 5 car formation will be in service as steam train "TAIJU" on TOBU railway this August 2017. C11 for pulling this train and the YO 8000 for integration in this formation will be on sale in August 2017. DE10 is available for sales now. In addition, we introduce actual train consists using 14 Limited Express Passenger Car, as shown in the formation image below you can use multiple sets and run in various combinations. *All appearance, specifications and car number subject to change without prior notice. How do you like to type 14 Limited Express Passenger Car lineup? This car has been an unforgettable de facto standard Japanese express passenger car. With our Rokuhan product, you can now replicate many standard Japanese express trains to add realism to your Z gauge world. We will keep supporting your Z gauge modeling and hope to assist you, in pushing your Z scale modeling with Rokuhan product. Delivery of "E6 Type Shinkansen Komachi" "TOBU Railway SL TAIJU Type" will start in July! in July in Japan, also start delivery for overseas soon after. Release date of E6 Type Shinkansen Komachi series will be in July! Note: All contents in pictures might be different from actual products without notice. Please follow on Facebook:Delivery of "E6 Type Shinkansen Komachi" "TOBU Railway SL TAIJU Type" will start in July!